From my coffee tour, you might have assumed that I only drink coffee at coffee shops. Untrue! How presumptuous of you! Just kidding you, but I do have to enlighten you. The truth is, Josh and I have brewed coffee at home almost every morning. There is something quite different to having a regular cup of joe at home than going out. First, there is the magical smell of coffee as you wake up. 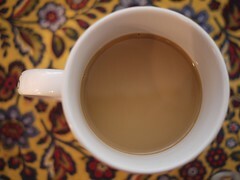 Second, you can enjoy a no-frills coffee to snap you into the reality of the day. Third, it gets you out the door (and perhaps to a coffee shop later). This weekend the mailman brought Josh and I a gift. Okay, it wasn't the mailman, but he was the bearer of good things. 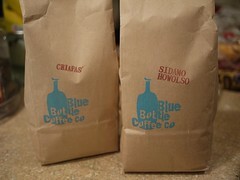 Our friends, Jeff and Melissa, sent us Blue Bottle Coffee beans from the Bay Area. Josh and I have been wanting to try this place forever. Now at last we can, and to top it off this week we've enjoyed something different than the usual! 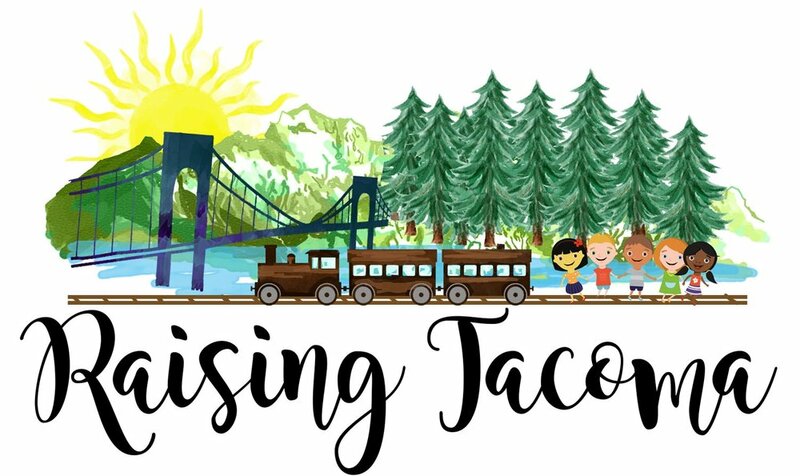 We received two tasty picks: Mexico Chiapas and Ethiopia Sidamo Howolso, both single origin coffees (from Mexico and Ethiopia - get it). So far I've enjoyed the Sidamo Howolso the best and Josh the Chiapas. When we opened both, we could tell it was something different than what we've been drinking. Both had very distinct smells. Mexico Chiapas - As I mentioned, this was Josh's preference so far. It has a smokiness to it. Josh said it was earthy. I think it was best when I added more creamer to it, and then I thought it was quite tasty. It's one that I think needs that milk to balance it out a bit more. 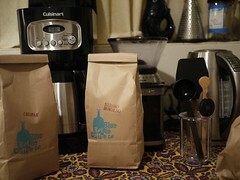 As I read the description on the Blue Bottle website I understand why it's a favorite for Josh. It says it is "a bacon-and-eggs coffee. Big bowls of chilaquiles" and other foods go well with it. Ethiopia Sidamo Howolso - This was my preference. It had almost a chocolately smoothness to it. The website says it is a "is a punchy, winey, fruity, leathery coffee." Hey, I like all that stuff. Well, maybe not the leather. Umm, I've never eaten leather, so perhaps I do like it and didn't know it. Either way, this one was quite nice too. 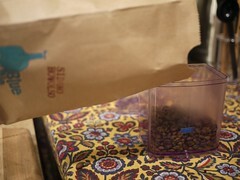 --Measure out the right amount of beans and grind. 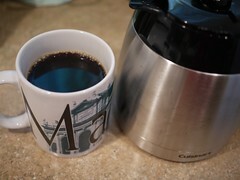 The coffee-to-water ratio is important to making a good cup. Our system is to fill the beans to the blue sticker - see it there. We did the math a while back and just stick to it. 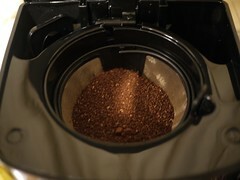 Also, you should double check the type of grind you should use for your machine. Flat bottom filters, cone filters, etc all are different grinds. What do I mean? The size of the bean that you grind...is it fine, medium, course? This makes a difference too! Are you getting it? So much magic in the making! 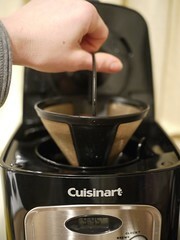 --Put the freshly ground beans into the filter. Now, don't be lazy and grind them all at once. It's tempting, but ground beans only last about 24 hours max before they start losing their yumminess. We push the envelope by grinding the night before, but who wants to grind in the AM (I'm sure our downstairs neighbors would agree). 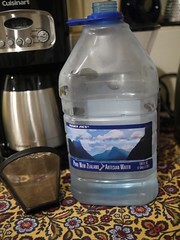 --Use some fresh, pure water. Using good, filtered water makes a difference! Are you catching the theme here...everything makes a difference! Everything. Everything. Mwahahaha. --Now, prepare the coffee machine. This is a new machine, so we are grinding them medium-fine. 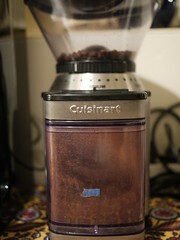 We love our new coffee machine (I broke our other one, but it was a cheap one luckily--from just after college). 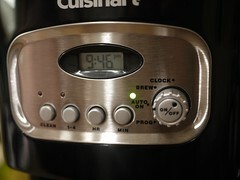 --Set the timer for a few minutes before you wake up. Remember, the best part of waking up, is <coffee> in your cup! Yes, we made coffee at 9:46pm. Auto On! --Wake up, sleepy head! Get your coffee on!